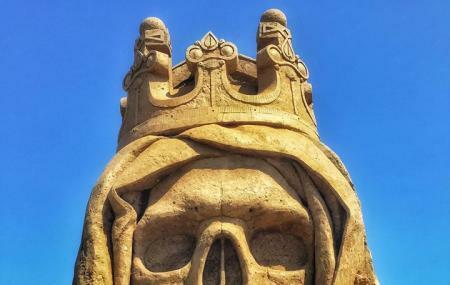 Located in the city of Antalya in Turkey, Sandland is no less of a fantasy wonderland for people of artistic sorts. Staying true to its name, it features an assortment of architectural gems made of sands by sculpting prodigies. The place is known to draw a lot of tourists during the peak season. The sand exhibits are work of creative natives who wish to put their work on display. Come here to witness the world in one place! From Egyptian mummies to Tajmahal and Buddha, there is no less of engagement and fun here. Come with family and get the best of what this has to give! There are some little food joints around to keep your hunger in check after the site-seeing. Please contact for a special discount for 10 people and over groups. Tickets can be obtained from festival booths. Students are entitled to an additional 45% discount on adult admission. An additional 30% discount is applied to the adult's entry fee to Turkish citizens. People normally club together Ancient City Of Aspendos and Iskele Mosque while planning their visit to Sandland. This was a lovely experience. Some of the statues were damaged due to weather conditions, we were told about this before we bought our tickets. It was still a memorable experience. Went last week n found most of the sculptures in broken / damaged. It was a mere loss of money and time. I guess it should be reopened to Tourists after correcting the damaged sculptures. Surely would have enjoyed if it was in its correct shape. Amazing sculptures. Really great to see this fantastic work and the detail...wow!! 😍 Lovely. Even the little cafe was good and prices were very reasonable! A very impressive area of major sand sculptures. We arrived just as the sun was setting so saw them in their natural colour, but we also saw the whole place lit up in multi colours. At 25tl each to get in, it was not expensive either.